Kitchen design has been about three things for the past few years: white cabinets; quartz or marble counter-tops; and subway tile back-splashes. The good news is, 2018 trends are veering away from a couple of these mainstays (quartz and marble aren’t going anywhere anytime soon!). If you’re getting ready to do or redo your kitchen, here are eight ideas to consider. 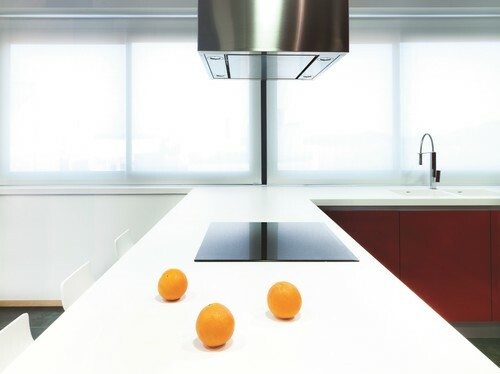 Perhaps due to the influence of Fixer Upper stars Chip and Joanna Gaines, who favor the material for kitchens, concrete is growing in popularity for counter-tops. They caution, however, that concrete counters can stain, scratch, and crack. They’re also not quite as low-maintenance as you might think. While you can DIY this project, beware: it’s not as easy as it looks. If you want to try it anyway, diy Network has a good tutorial. As for finishes, look for wood cabinets to make a comeback, giving white a run for its money. “The return of wood cabinets was almost inevitable, but, instead of the heavy, figured doors of the 1990s, today’s wood cabinets are either very modern, or in basic rustic styles…which feel authentic and organic – as if they were born there,” said Apartment Therapy. 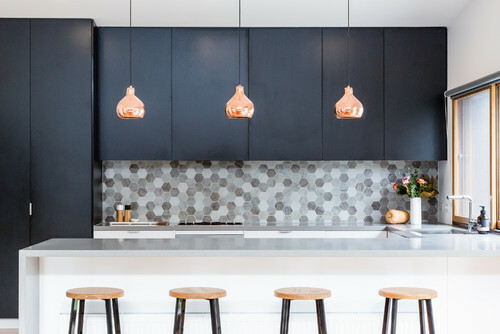 Fixtures have been moving out of silvery finishes and into gold tones, but black is another option that is gaining heat. “Black is classic in the fact that it will always work with just about every style and color palette that you have going on,” said Emily Henderson.